The Klipsch R5 Neckband is now on-sale in the UK and delivers the famed Klipsch sound through Bluetooth earphones. The Klipsch R5 is not your standard collar-sitting portable audio provider. Firstly the set features a hand-stitched, edge-treated leather neckband. Furthermore, the compact R5 is light and so is comfortable to wear either against your skin or tucked under your shirt collar. Though incredibly compact, the R5 carries an impressive level of technology. Of course, being equipped with Bluetooth means that the R5 will wireless connect and pair with a multitude of devices. Additionally, it plays nice with both aptX and AAC high-definition Bluetooth streaming. The R5’s built-in, rechargeable battery is good for over eight hours of music and taking calls. When being used for chatting, the R5’s integrated cVc microphone enhances vocal clarity and reduces environmental noise. Also, the R5 vibrates when you receive a call and its raised controls let you answer, as well as adjust volume and, when listening to music, skip tracks. You’ll also be pleased to know that the Klipsch R5 is even rated IPX4, meaning it can cope with the likes of rain and spray from any direction. 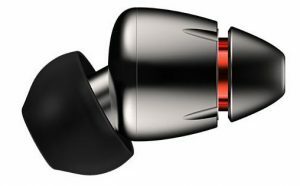 The R5’s earbuds are each loaded with a 5mm micro-driver. The little acoustic modules help ensure a deeper fit and hold. This creates an ideal platform from which to keep your ears entertained. Even better, the R5 features its maker’s patented contour ear tips: anatomically designed to accurately sit inside the ear canal. The oval tips reduce ear fatigue as well as form the perfect seal for noise isolation and bass response. The Klipsch R5 is on-sale now in the UK at an SRP of £115.00. For further information please visit www.henelyaudio.co.uk.